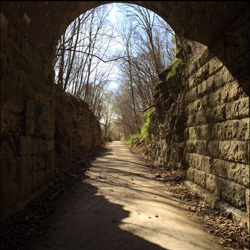 Rocheport Tunnel on the Katy Trail. Photo courtesy of Stacey Oldfield, Agent. Schools are back in session and summer is almost over. Perhaps you couldn’t find the time to get away this summer, but are looking for a little adventure before temperatures cool down. Maybe you’re planning a trip this fall and are looking for ideas. Did you know Missouri has 453 small towns with populations less than 1,000? Small town living is not for everyone but they are fun places to visit! We’ve compiled a list of a few neat little towns in Missouri with less than 500 residents. You may have never heard of some of these places, but they are rich in history and also have entertaining things to offer. Caledonia, MO: Population 130 (aka “Caley”). Caledonia is located in Washington County in Eastern Missouri’s Bellevue Valley. Just 10 miles from Elephant Rocks State Park, Caledonia was named using the Latin word for Scotland. Much of the town still looks as it did in the nineteenth century, but many homes have been restored and are now restaurants and shops. Kimmswick, MO: Population 157. You’ll find Kimmswick south of St. Louis in Jefferson County. This town hosts annual apple butter, strawberry, and bluegrass festivals. There are several shops and two bakeries. Centerville, MO: Population 191. Centerville is the county seat of Reynolds County and located on the Black River in Southeastern Missouri. It is a scenic little town near the St. Francis Mountains, in the Arcadia Valley. Rocheport, MO: Population 244. Its right down the I-70 from Columbia, and if you haven’t been here, you’re missing out. Yes, there is a winery, but there are also antique shops, bikes to rent, several café’s and the scenic Katy trail to explore. Downing, MO: Population 335. Downing is located in Schuyler County, not too far from Kirskville and is rich in Civil War history. Stop to grab a bite to eat at The HammerMill, an old feed store turned bar and grill. You might even luck out and hear the Bruce Poe Band play there! If you will be renting a vehicle for your out-of-town adventure, we’d like to offer some advice. If you carry “full coverage” or “physical damage coverage” on your auto insurance policy, you do not have to purchase coverage from the rental car company. Your liability and physical damage coverages will extend to a rental car at the same liability limits, as well as comprehensive and collision deductibles listed on your policy contract. Be sure to bring proof of your current auto insurance to the rental car agency. Before you hit the road, you’ll want to make sure your trip is planned well enough to get you to your destination, but is flexible enough to allow for a few diversions or extra pit stops. Remember to bring a real map (you know, the paper kind? ), a spare car key, some cash, and also make sure your spare tire is aired up. As always, we would like to remind you not to text and drive…or more recently, Pokemon Go and drive. Finally, make some memories, be safe, have fun, and if you visit one of the small towns listed above, post your pictures on our Facebook page!